If you have 'Calvin Begay Reversible Sterling Silver Pendant' in your shopping cart go to View Cart at the top of the page to check out. If you are having any problems with the checkout process we are here to help. Call us toll free 1-877-892-0297 to place your order. Genuine Picture Jasper, Tiger's Eye and Acoma Jet inlaid in Sterling Silver. Stunning Fire and Ice Lab Opal Accents. 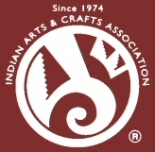 The Reverse Side features a Contemporary Sterling Silver Corn and Kachina Design. 18" 2.2mm Sterling Silver Rope Chain. 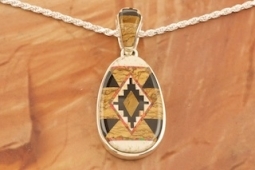 Pendant Designed by Navajo Artist Calvin Begay. Signed by the artist. Pendant is 2 1/8" L including bale x 1" W.